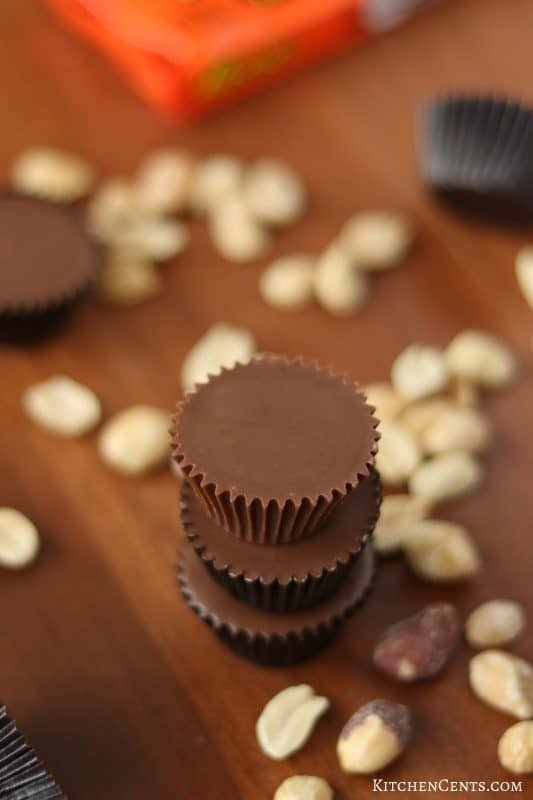 Copycat Reese’s Peanut Butter Cups – the best copycat Reese’s peanut butter filling covered in creamy milk chocolate and molded in an easy-release candy paper cup. You’re only 4 ingredients + milk chocolate + easy-release wrapper away from amazing homemade Reese’s peanut butter cups. If you frequent my little corner of the internet, you know my family gets together each year to make Christmas chocolates. When I say make chocolates I mean… MAKE CHOCOLATES! Like 80 to 100 pounds of hand-dipped and molded chocolates, we gift to friends, family, neighbors, and co-worker for Christmas. A few years ago we switched things up a bit. Instead of making these easy peanut butter balls we decided to make a copycat recipe for mini Reese’s peanut butter cups that were molded in a paper cup just like Reese’s minis. 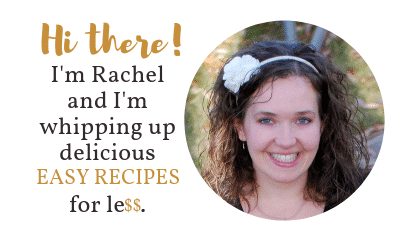 It was so fun to see how they turned out… just like Reese’s (a favorite candy of mine)! If you love Reese’s peanut butter cups you’re going to love this recipe! HOW HARD IS IT TO MAKE THE COPYCAT REESE’S PEANUT BUTTER FILLING? The peanut butter cup filling is so easy to make. 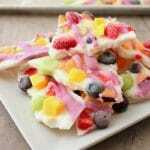 It only has 4 ingredients. You can find step-by-step instructions with pictures on how to make this easy peanut butter filling here. It takes about 5-10 minutes to make a batch. Once it’s made you just refrigerate it for an hour or two to help it firm up and you’ll be ready to go. If you’re in a hurry, you can use the filling right away but you’ll find it’s easier to handle if it’s been chilled. HOW HARD IS IT TO MOLD THE PEANUT BUTTER CUPS? It’s probably easier than you think. Rather than dealing with candy molds, I use glassine candy cups. This makes it much faster to produce a large number of candies without having to wait for the batch setting in a mold to harden enough to remove them. To form the mini peanut butter cups pour a small amount (about 1/3 full) chocolate in the bottom of the cup. 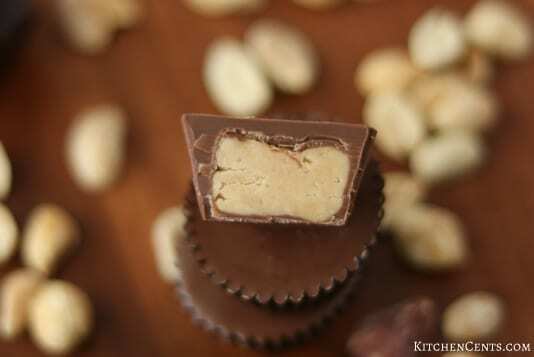 Place a small ball of peanut butter filling (that’s been flattened) into the cup. Press it down gently to allow the chocolate to come up around the sides. Add a small amount more of chocolate to the top. 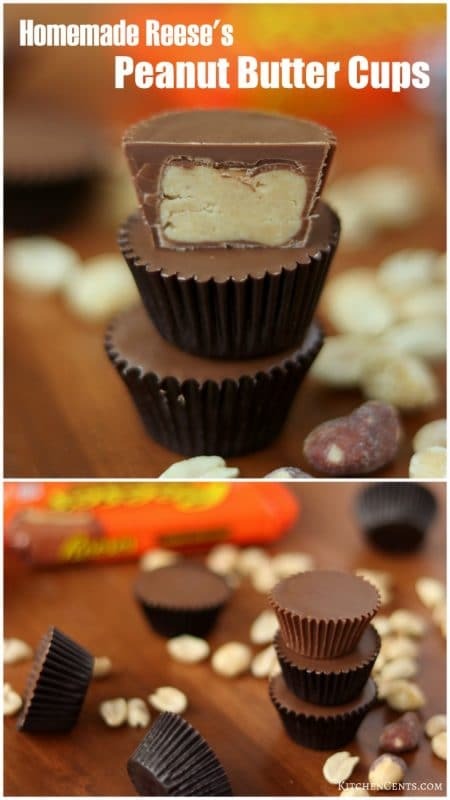 You’ll add just enough to cover the peanut butter filling without going over the lip of the candy cup. Smooth then tap to level the chocolate and give the candy a smooth top. Note: Make sure the peanut butter filling is pressed down below the top of the liner so you have room to fully cover it without overfilling the cup. WHAT’S THE DIFFERENCE BETWEEN GLASSINE CANDY CUPS AND REGULAR PAPER CUP LINERS? Glassine candy cup liners are grease proof liner that offers a quick release, nonstick quality, especially when working with chocolates and candy. They have been steam treated to give the cup a shiny look. 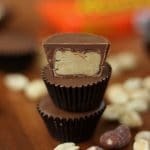 They are typically more expensive than regular paper cup liners but when making these peanut butter cups they’re worth the extra cent per cup. Regular paper liners can be used in high heat baking such as when making mini muffins. 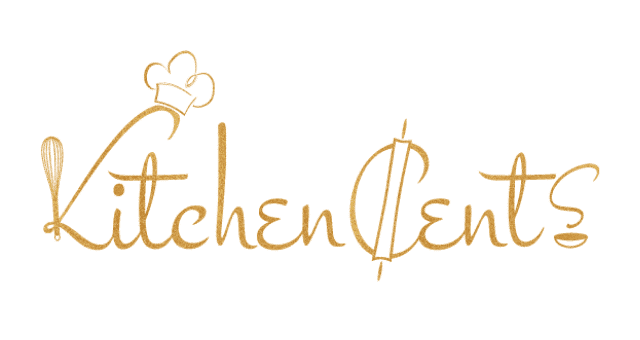 They are not greaseproof and will often leave unpleasant grease spots on the paper cups. They are typically the cheapest option but because they are not greaseproof they will not work for these chocolate peanut butter cups. The chocolate will begin to absorb into the paper and make it very difficult to remove from the liner when ready. 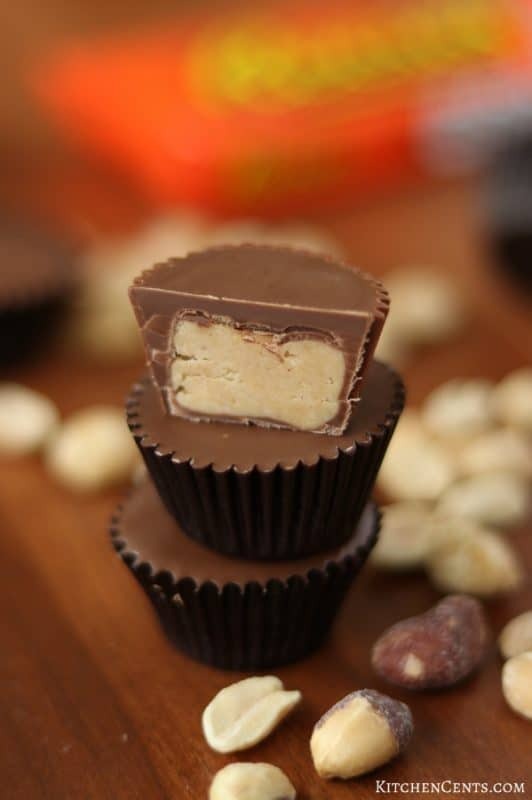 I use the glassine candy cups to make these chocolate peanut butter cups. You can find them here (on Amazon). To make these butter cups look just like Reese’s mini peanut butter cups I use the brown glassine cups. If you’d prefer a traditional large cup, like Reese’s peanut butter cups, use these ones here. How do you like to eat your Reese’s peanut butter cups? Here’s the full printable recipe. Enjoy! The best copycat Reese’s peanut butter filling covered in creamy milk chocolate and molded in an easy-release candy paper cup. Mix butter and peanut butter until combined. Add enough powdered sugar to form a dough (non-sticky to the touch). Add additional powdered sugar if needed. Form filling into "snakes" about 3/4 inch in diameter and cover or roll in waxed paper. Chill 1-2 hours (this will help chocolate harden quicker) and make filling much easier to work with. Once chilled cut into 1/2 inch pieces. Using glassine #4 candy cups, fill 1/3 full with melted chocolate. Gently press a piece of the peanut butter filling into the chocolate. Make sure the peanut butter filling is below the top of the candy cup to allow room for the chocolate to cover it without overfilling. When pressing down, allow extra chocolate to come up around the filling. Cover filling with a small amount of melted chocolate. Make sure not to overfill. Immediately tap to smooth chocolate. Let the finished peanut butter cup fully harden before moving. Only use dry roasted peanuts to grind otherwise you'll end up with homemade chunky peanut butter. 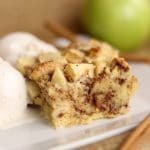 Use a blender or food processor to achieve a fine chop/ground. 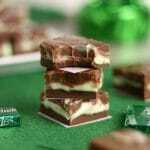 Place finished chocolates in fridge or freezer to speed up set time. To make tapping and moving finished peanut butter cups much easier, use a mini muffin tin. Place one glassine paper cup in each hole. The peanut butter cups will be much smaller than the mini muffin tin holes but will be much easier to make, tap and move multiple at a time.